Do Lochside and Galloping Goose mean anything to you? 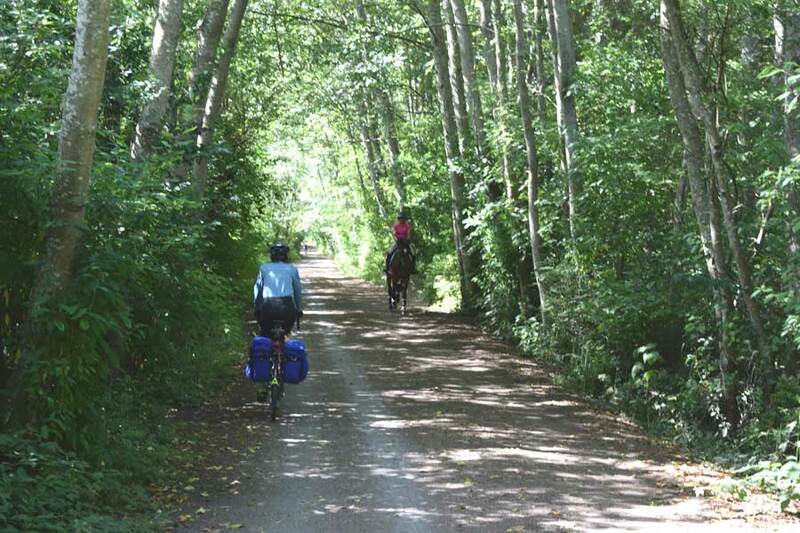 If so, you’ve probably cycled the Saanich Peninsula on lower Vancouver Island. The trails get you around the Victoria area, up to Sidney and over to Sooke. This is one of our favorite short and easy cycle touring routes. The MV Coho, out of Port Angeles, gets you to Victoria in 90 minutes, or you can come down on the BC Ferries Tsawwassen ferry from Vancouver, also in 90 minutes, to Sidney. The Lochside Trail connects Sidney and Victoria. We camp at Sidney, explored around on our bikes on the way back, then go down the Galloping Goose trail a ways and bike-camp there as well. The Lochside and the Galloping Goose connect at the Switch Bridge. They are well-maintained, have great signage, and offer connections to the towns, ferries, and rural landscape on the Peninsula. A Lochside Trail stop includes a bike repair stand, nearby water, restrooms…and softball! Most trail signs are what you’d expect: modern, painted metal. Nice to see these quaint wooden ones. Good signage keeps you oriented. The Switch Bridge offers a bike-friendly water fountain and train-themed bike rack. This is where the Lochside and Galloping Goose trails meet. Wooden trestles are abundant on the trails. This is the Selkirk Trestle just out of downtown Victoria. We travel pretty light when bike camping, but that doesn’t keep us from provisioning with cheese, bread and wine to accompany our freeze-dried dinner. Susie eyes the Fisgard Lighthouse at Fort Rodd Hill Historic Park from the road cutting across the Esquimalt Lagoon in Colwood. The bike rack at Six Mile Pub notes that it’s “Proud to be a biker’s bar” and offers complimentary bike locks at the bar. The pub, off the Goose in the View Royal area, is the oldest in B.C. 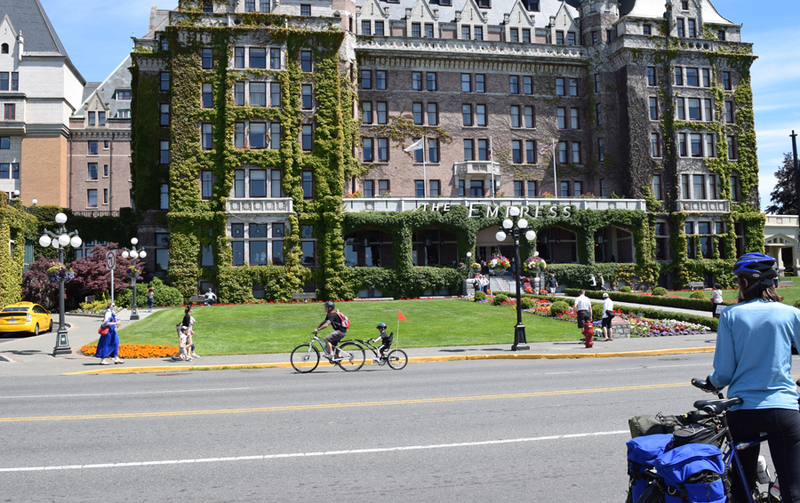 Wharf Street in front of the Empress Hotel has generous bike lanes. If you want to explore more of the region, why not take a bike ride from Seattle to Vancouver? For details, see my article Seattle to Vancouver: A Great Summer Trip.